How Do Squirrels Get in My Attic? To many, squirrels are nothing more than cute, harmless critters seen running around parks and in the trees, but to others, they pose a much more serious threat. All throughout the Tampa area, squirrel infestations are becoming more and more common, and when your home’s attic is invaded by squirrels, the results can be expensive. 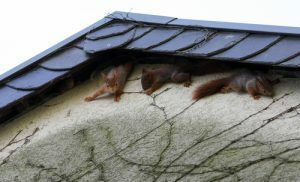 Thanks to their excellent climbing abilities and small size, squirrels are able to infiltrate an attic through even the smallest hole in a roof vent or soffit. If there isn’t a hole to squeeze through, squirrels can even chew through certain materials to gain access – meaning that even if you own a brand new home, you’re still at risk. During your consultation, a Critter Control® technician will thoroughly inspect your home for possible entry points, all of which can be sealed once the squirrels have been removed. If you notice any of the above signs of a squirrel problem, the best course of action to take is to call a professional animal removal service like Critter Control® of Tampa in order to prevent further damage to your home. For more than three decades, Critter Control® has been a top name in animal removal throughout the United States. Our exclusive four-step method helps us ensure that every last squirrel is removed from your home, and any damage is repaired along the way. For any questions about our squirrel removal services, or to schedule a consultation, call us today at 813.948.0870.